I’ve written a bit about the show we produce for Stronger Families, a non-profit organization that advocates for healthy marriages and strong families. The show (Stronger Families LIVE with Jeff Kemp) does an outstanding job of picking the brains of marriage experts with a variety of special skills. We worked hard to deliver a Pay-Per-View program that added a great deal of value to our viewers, but we wanted to further extend what we could offer people in need of this kind of content AND further increase revenue. I just got a peek at the results of one of my favorite tips for increasing the revenue brought about by any Live Streaming Video production; that is, by creating an “available-for-sale” DVD. 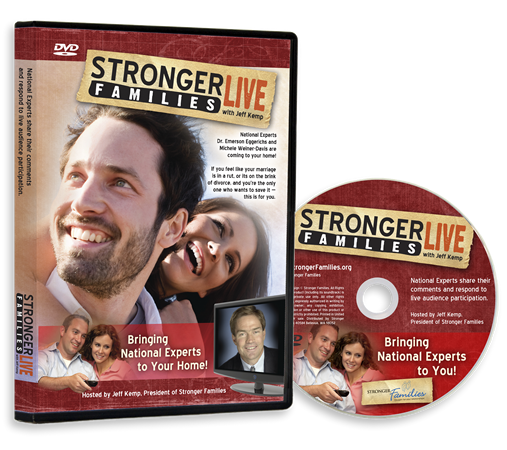 By working with our DVD/CD manufacturing partner (Acutrack), Stronger Families took their Pay-Per-View episodes and packaged them into this retail-quality DVD seen on the right. For the first four episodes we produced, they plan to create two DVDs—each with two episodes. What’s great about this is that the investment in the live event will be paying dividends to Stronger Families for years. 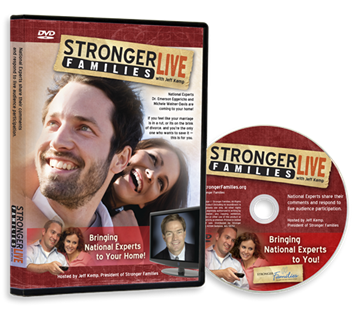 By adding a video-on-demand and DVD option, Stronger Families has tripled their income options for Stronger Families LIVE. Pretty nifty. The key to increasing your revenue OR marketing value is to ensure you are recording your live streaming video production in such a manner as to allow for the reuse as either a high-quality video-on-demand offering or a DVD. This means that recording your live event as a FLASH video is not good enough. Be sure to record in a non-Flash format that is capable of being eventually rendered in a quality suitable for DVD. As you can tell, I’m excited about all this. How about you? Are you considering producing a live streaming video production and adding a DVD component to the overall offering? Have you already done so? Let me know. . .I’d love to shine a flashlight on others with similar success (or concerns).